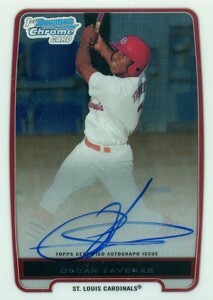 One of the key prospects in 2012 Bowman products, Oscar Taveras is on fire. Heading into Spring Training, he's become one of the hottest players in the hobby as collectors are really starting to see what the outfielder is made of. Shop for Oscar Taveras cards on eBay. Entering the 2013 season, Taveras is ranked by both MLB.com and Baseball America as the third best prospect in the game. In 2012 with Double-A Springfield, he hit an impressive .321 with 23 home runs and 93 RBI in 124 games. Although it's very unlikely Taveras will make the Cardinals' Opening Day roster in 2013, his hot start is getting him noticed. St. Louis currently has Carlos Beltran, Matt Holliday and Jon Jay patrolling the outfield, so it will likely take an injury or a major roster move to make room for the Dominican-born prospect. However, it is likely that, at some point, Taveras should see some time in St. Louis. The better bet for an everyday spot is 2014. Carlos Beltran becomes a free agent after 2013. If Taveras is deemed ready, it would make sense for the Cardinals to let the veteran walk and open up a spot. Collectors have taken notice of Oscar Taveras cards as of late. As a result, prices have surged. At the start of December, raw copies of his 2012 Bowman Chrome Prospect Autograph was a brisk seller at $75. Since then, it has doubled. The same observation can be made across the board for his other cards, which of which were released in various 2012 Bowman-branded products. 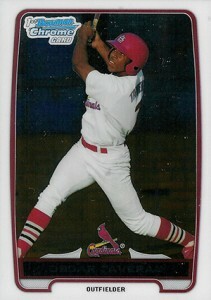 So where's the ceiling for these early Oscar Taveras cards? It's tough to say. Some are cashing out now, having made a strong return. But with so much upside, is there still room for growth? Absolutely, but now it's going to have to come more from performance than speculation. Some collectors may be dreaming of the second-coming of Mike Trout. Trout's cards were in a similar position last year and those exploded. Expecting Oscar Taveras cards to follow suit is unrealistic, at least for now. Yes, there are similarities between the two, but Trout's 2012 season was something special. Expecting lightning to strike twice is unreasonable. But that's not to say they've peaked. Not even 21-years-old, youth is very much on Taveras' side, even if that means another season in the minors. Here's a look at some of the top Oscar Taveras cards available right now. At this point, all are either minor league cards or inserts. None are official rookie cards. That said, his Bowman cards will be some of his most popular cards, likely more sought after than a lot of his official rookies once they're released following his MLB debut. We've focused on basic cards and inserts, not parallels. Those add another level of chase for those looking for high-end cards. 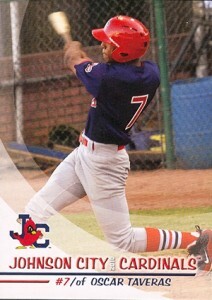 The 2010 Johnson City Cardinals Oscar Taveras is the outfielder's first-ever card. The minor league card was distributed by the team and is relatively tough to find. Traditionally, these minor league cards have more of a niche appeal among player collectors and prospectors. With just 25 copies, these don't pop up often. However, the striking look is tough to ignore. The fact that Topps is continuing the Bowman Black line could bode well for the future as the cards gain more of a following. That said, the 2012 cards are extremely condition sensitive and usually come with chipping along the edges. 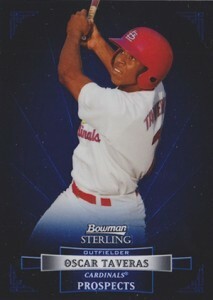 The 2012 Bowman Chrome Oscar Taveras is the launching point for any collection. Readily available, it's relatively inexpensive. It has lots of tradition behind it as well. For those seeking a chase, there are plenty of parallels to go after. If you're looking for the key Oscar Taveras card, this is it. It can be found in 2012 Bowman Baseball. Bowman Chrome Prospect Autographs have become the benchmark against which all a player's other cards are measured, even official rookie cards. The base version isn't numbered, but there are several Refractors that are. For high-end collectors, the Blue Wave Refractor, which is numbered to 50, may be the way to go. Blue Wave Refractors were only available via a wrapper redemption offer that quickly ran out. 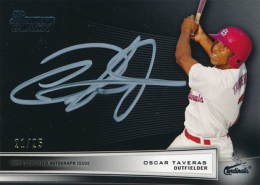 The 2012 Bowman Chrome card may be more recognizable, but for those without the budget for an autograph, the 2012 Bowman Sterling Oscar Taveras may be the next best thing. The high-end product focuses mainly on autographs. As a result, the base cards and Prospect inserts are something of an afterthought. With so few per box, they're tough to find. Prices for the card are strong, but not unreasonable. OSCAR TAVERAS - 2012 Bowman Chrome Autographed Pristine Rookie BGS 10 w Auto! 2014 Topps Chrome #19 Oscar Taveras ... RC ... PSA 10 Gem Mint !! !